The G.A youth have been actively selling home made, eggless cookies in bottles during Geeta Jayanti. 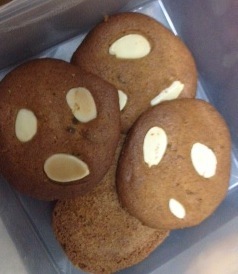 A big THANK YOU to so many of you who have been so kind to buy our freshly made cookies for charity! We do hope that you enjoy them very much! As there are still 9 days left to Geeta Jayanti, we will still be selling the cookies on a daily basis – so for those of you who haven’t tried them yet, do stop by our little stall and have a sample.. Previous Website Launch! :D :D :D Next Our Condolences.